To the right you will see results of Jake's first audiological testing after our move to North Carolina. His pure tone testing in the sound booth showed a progression in his hearing loss. Further testing showed absent distortion product otoacoustic emissions (DPOAE'S). He now had what they called a U-shaped or cookie bite configuration to his audiogram, with hearing between 60dB and 95dB. He had better hearing in the extreme high and extreme low frequencies. 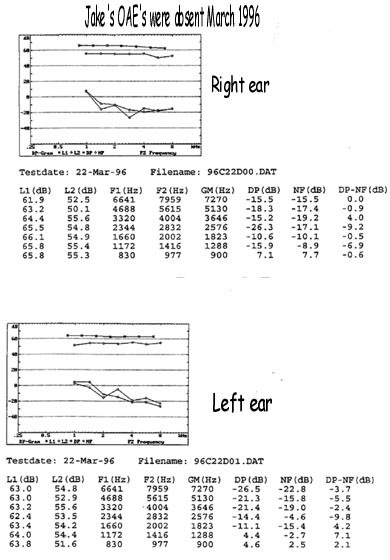 At diagnosis he was estimated to be hearing around 55-60dB, so this was a significant change. Based on these findings, and the fact he had the secondary sensorineural loss, he was fitted with bilateral Phonic Ear FreeEar BTE aids with built in FM system. 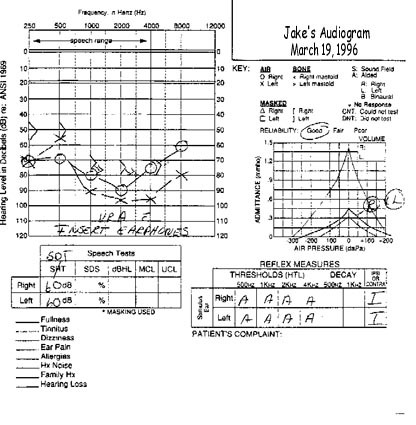 His aided audiogram is pictured at the bottom of this page. As you see, he had wonderful aided thresholds that fell well within the speech range. Please be aware that an audiogram that shows aided hearing in the speech range doesn't necessarily mean a lot to a child with Auditory Neuropathy. 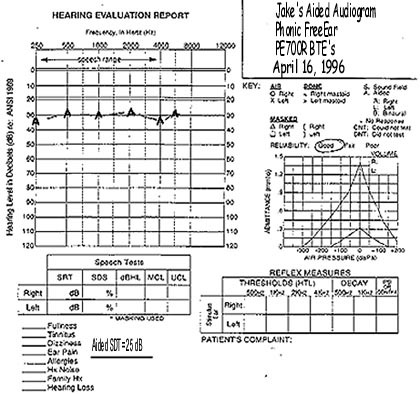 Jake did get some speech recognition with aids and he liked them, but never progressed as expected with the aided audiogram he had.